Mariah Carey was the guest of honor at the Empire State Building last week, where she was given the important task of turning on the lights of the building for Christmas. In the spirit of the holiday season, Mariah wore a festive red cardigan and black tights styled with a thick leather belt. The American singer, songwriter, record producer, and actress wore a five-inch pair of Alaïa lace-up ankle booties to add a little bit more “Mrs. Claus” to the look. 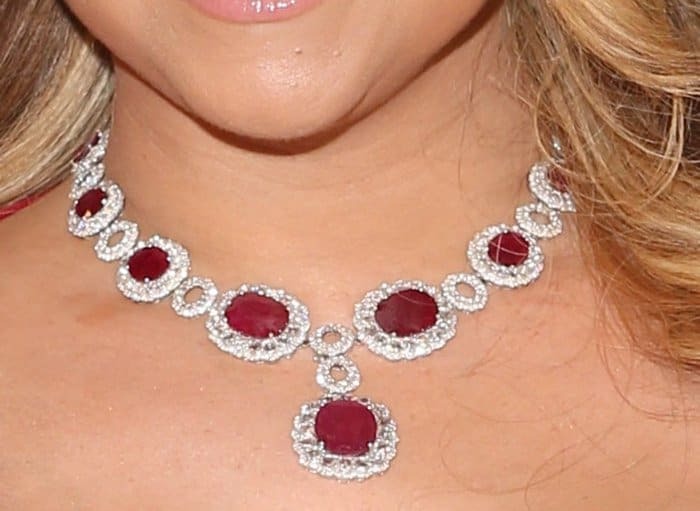 Of course, no outfit of Mariah’s would be complete without some very expensive diamond jewelry. This diva added major glam to her ensemble with a chunky layering of sparkling bracelets on both wrists, solitaire diamond earrings and a stunning ruby necklace. Obviously, the star of this whole ensemble was the jaw-dropping necklace! Mariah made sure to pose properly, showcasing her blinding jewels to the photographers. This expensive concoction of jewels would probably be a little too much to the average celeb, but definitely not to Mariah!